Fang Rock has always had a bad reputation. Since 1955 the lighthouse has been out of commission, shut down because of fire that gutted the entire tower. But now, finally updated and fully renovated, the island and lighthouse is once again about to be brought back into service. Students have gathered on Fang Rock to celebrate the opening of the ‘most haunted lighthouse of the British Isles’, but they get more than they bargained for when the ghosts of long-dead men return, accompanied by a falling star. Colonel Lethbridge-Stewart is brought in to investigate what he believes to be signs of alien involvement. But it is not only Lethbridge-Stewart who has an interest in Fang Rock. Anne Travers is called to her family solicitor’s, who have in their possession a letter from Archibald Goff, the paranormal investigator who once visited Fang Rock back in the 1820s, and along with it a piece of alien technology. With a foreword by Louise Jameson, who played Leela, the Doctor’s companion from 1976-1978. 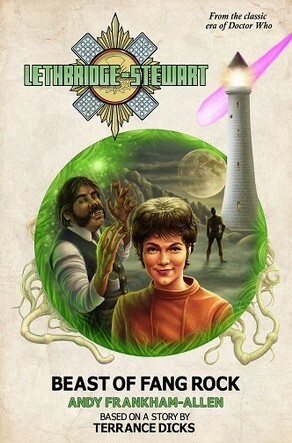 The third book in the Lethbridge-Stewart novels series. Welsh-born Andy Frankham-Allen's passion for writing began with a love of Doctor Who. He's been writing as long as he can remember and has been working professionally since 2004. His work includes several official Doctor Who short stories. March 2011 saw the release of his debut novel, Seeker, the first book in The Garden Saga. Also available as an audiobook. CLICK HERE to order.